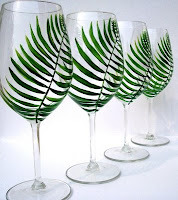 I am very honored to be featured in the following treasury - Palm Breezes that features a range of palm leaves inspired items! I love the beautiful range and the refreshing green color. These are absolutely beautiful. The colors and painting is so real that it looks like a real palm leaf. I think they are classy and chic to be used for a nice breezy Sunday brunch. This necklace is really interesting and beautifully made. 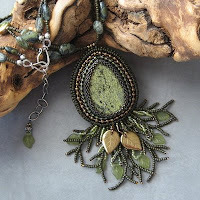 I love the seed beads that are used as the branches. 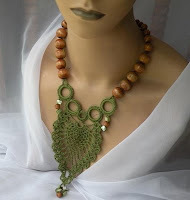 This necklace is really intricate made especially the olive green crochet centerpiece. 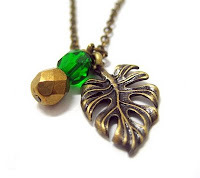 I have always love brass charms and the delicate palm charm is really cute. Love Palm trees! Congrats on being featured in such a beautiful treasury! How nice with all the Treasuries lately....Green is my favorite color. I love the Little Palm Leaf Necklace! YART SALE - What are you doing?